Since Alien: Covenant drops on Friday—and since it’s really good—it’s time to prepare yourself by revisiting the best elements of the franchise from whence it burst. Yesterday, we made ourselves queasy looking back on its many death scenes, so today we’re wiping the blood from our eyes to take a closer look at one of the original film’s unsung bits of brilliance. On YouTube, The Film Theorists just published a video essay that offers a deep exploration of the nuances of Alien’s set design, both on the Nostromo and on the derelict alien ship where they first encounter the Xenomorphs. Vastly different in aesthetic, structure, and size, the ships each serve to heighten the horror aspects of the film, elevating it beyond pure sci-fi. What’s especially interesting is the materials art director Roger Christian drew upon to help create the Nostromo. Instead of filling the ship with blinking, unfamiliar doodads that hearken towards a dated idea of space-age technology, Christian and director Ridley Scott drew upon World War II bomber parts to create the interiors and outdated cathode ray tube TVs to serve as the ship’s displays. 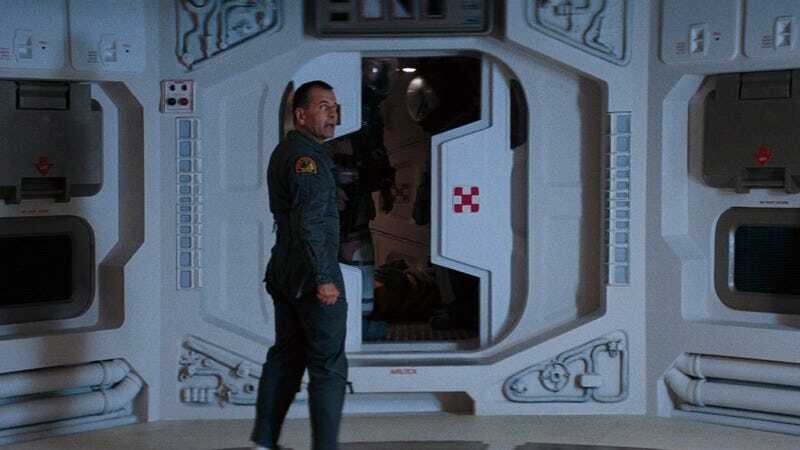 Combine the grimy, shopworn look with the film’s abundance of natural lighting—and the many shadows it casts across the ship’s narrow corridors—and you’ve got a realistic setting that helps achieve the sense of claustrophobia Scott hoped to conjure. See, it’s not all about the gore. But, just so you know, Alien: Covenant will be very, very gory.